Here in Southwest Florida, this is such a wonderful time of the year! No wonder the snowbirds flock to us during these wonderful winter months, when the sun is shining but humidity is down and you can even have the windows open to let in a breeze. Soon though, you’ll be using your air conditioner every day again. But if your unit is more than 10 year old, now is the best time to start thinking about having it replaced, since you don’t want to wait until the heat is demanding a lot from your current older unit. You have numerous options for brands of air conditioner, but did you know, that you also have a few different types of air conditioners to choose from before you even choose a brand? Here are the three main types of air conditioning units to consider. Chances are good that your home already has the air ducts necessary for standard central air, since they have been around for a long time. They are versatile and affordable and provide the level of cooling and reliability most of us are used to. You may not think you would need heat here in SWFL, but the reality is that in the months of December, January and February, we sometimes need that extra little boost of heat, especially at night and in the early morning. This is especially true if you are a “pelican” who lives here year round, or if you are someone who is on blood thinners, which make you less cold tolerant. Heat pumps are built in a similar way to air conditioners, except they have the ability to switch their refrigerant flows back and forth in order to offer both heating and air conditioning functions on demand. This offers a climate control system for the entire year that saves some money on operating costs. This is also a form of heat pump, but it does not use duct work. Instead of a centralized unit, a ductless mini split system uses a number of smaller air handlers installed around the house. Each handler only conditions one room in which it’s installed and up to four air handlers are connected to a single outdoor unit. This is a highly energy efficient model because each air handler operates autonomously from the rest of the system and has its own individual thermostat. This option also offers the ability for everyone to have their room at the temperature they like best, and you don’t waste energy on rooms that aren’t being used. They require more construction effort, but may be worth that effort if you are looking to save money on energy in the long run. 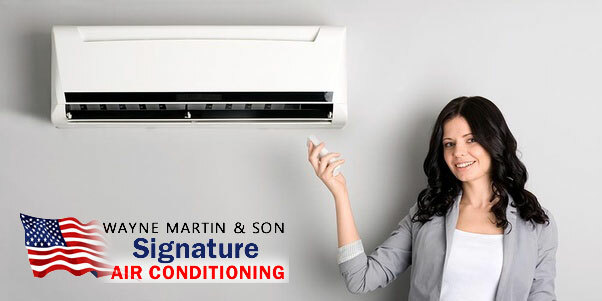 At Wayne Martin and Son Air Conditioning, we do installation for all three types of systems. Call us today for a free consultation! Contact Wayne Martin and Son Air Conditioning at 239-462-4068.